How safe is your property from unwanted guests? What means do you utilize to ensure your company is safeguarded from intruders? Are your corporate secrets being compromised? ONQPI Services Electronic Countermeasure Sweep, also referred to as Debugging Services, Countermeasures Services or Bug Sweeps, handles all types of electronic eavesdropping operations. Protect your information and privacy from getting into the wrong hands. 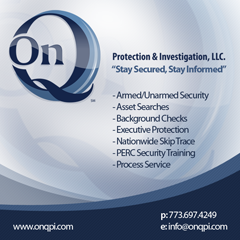 On Q Professional Investigations can provide a comprehensive, on-site analysis of an entity’s facilities thereby identifying all security threats, risks and vulnerabilities including an assessment of its current security measures. ONQPI makes recommendations based on this analysis and works closely with clients to implement them.